The first time you experience Fallas, amongst the sensory overload of the thunderous fireworks, the colourfully crazy fallas monuments and the crowded streets, one of the things that stays with you is the music of the marching bands which constantly criss-cross all over the city. 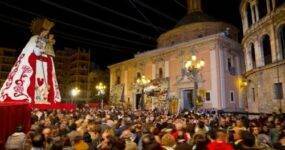 During Fallas, there are around 360 bands in the city accompanying the falleros of each falla wherever they go. Almost as ubiquitous as the bangers and fire crackers, you are never far away from the blast of the french horn, the call of the clarinet and the boom of the big bass drum. Fallas wouldn’t be Fallas without them. You won’t be able to get those pasodobles and other fallas favourites out of your head for weeks. Every morning in Fallas you hear them in the Despertá (in which local falleros kindly wake you up and gently remind you there is a festival taking place by throwing bangers and marching a brass band down your street at 8 o’clock in the morning). Later in the day they play a big part in the fun of the parades and “pasacalles” where they let loose a bit and enjoy themselves, jigging about with the falleros and the kids of the falla. They go along with the falleros around the city to collect any prizes the falla has won (if you take the metro, don’t be surprised when you find a full-scale brass band squeezed into the carriage) and, perhaps, their big moment is when they take part in the Ofrenda, the offering of flowers to the Virgin. 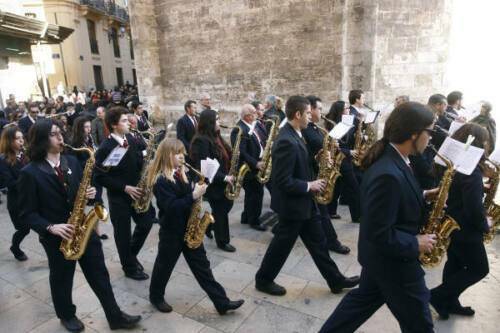 The bands, in a more sobre attitude, dressed in their best uniform and with shoes shined, march up to the cathedral along with the falleros in their full, fancy regalia. 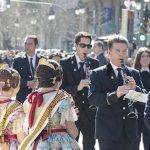 The bands are not falleros themselves but are hired for the week by each falla. 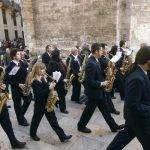 In many cases a falla will hire the same band every year and form a long standing friendship with the musicians. The bands come from all over the Valencia community and stay in the city for the week of Fallas. 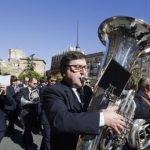 There is a great tradition for this type of music in Valencia and almost every town or village in the region, however small, has its own band or bands which the local community takes great pride in and music classes are often free or heavily subsidised for anyone wishing to become a member of the town band. 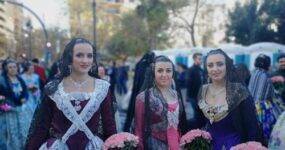 Fallas is when they are most evident but they also take part in other festivities all over the region. For the last twenty years bands have played at half time at Valencia’s Mestalla stadium, something unique in the Spanish first division. Until he passed away in 2014, the bands were always led around the stadium by Nicasio Agustina the legendary, elegantly dressed “l’home del puro “ (the man with a cigar), a suave no-messing-about sort of man with an easy smile who’s become part of the matchday experience, telling the bands where to march and where to stop and turn to the crowd to play their pasodobles as he puffed on his Cuban cigar. In 2019, crowds still applaud the band on match day and even “Lo lo lo” along with the (same old) tunes you hear in fallas “Paquito el Chocolatero” and “La manta al coll”. Music bands are particularly popular around the “comarcas” of La Hoya de Bunyol and Camp de Turia, especially in the town of Lliria. Out of just 15,000 people who live in Lliria, 2,000 of them play a band instrument to a decent standard and a further 1,000 are in the process of learning to play. The town hosts two of the most famous bands in the region. The “Banda Primitiva de Liria” is said to be the oldest of its type in Spain and was founded in 1819. Their great rivals “Union Musical de LLiria”, originally established by musicians who split off from the Banda Primitiva, was officially founded in 1903. 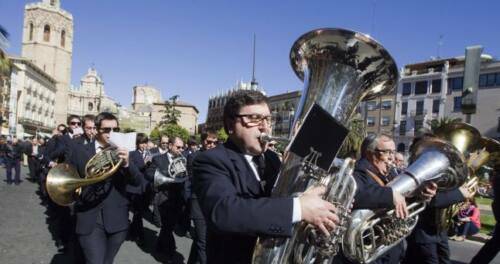 These are the Barça and Real Madrid of the Spanish brass band scene and between them have won nearly all the brass band competitions available to them in Spain, Europe and further afield. They have played with the London Symphony Orchestra and the Moscow Opera orchestra and have toured all over the world. They are fierce rivals. In Lliria you are either associated with one band or the other. It is said that in the past mixed marriages between the bands was frowned upon! Both, of course claim to be “the best band in Lliria” and the whole town is in thrall the second Sunday of July to see who will win the International Valencia Music Competition (one of the two Lliria bands nearly always wins). Until the economic and social changes of the 1950s and 60s, people living in rural parts of Spain would rarely travel too far away from their village. In a world where there were great differences between urban and rural life, being in a band and coming to Valencia during Fallas to hobnob with the city dwelling upper-middle classes and their elegant sons and daughters was an attractive prospect. In their villages it was a sign of advancement and modernity. 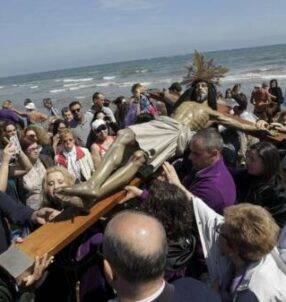 In the city, people spoke of these countryfied valenciano speakers coming to the city to see the sea for the first time. All this changed in the space of a decade with the great influx of rural workers into the metropolis, to work in the factories and live in the new neighbourhoods springing up around the outskirts of the old city. These people in turn set up their own fallas, changing the face of the city and the festival itself. In the sixties, the political climate meant that fallas seemed, to some extent, to move away from its essential sense of chaotic, bustling fun. The sombre religious elements were emphasised. 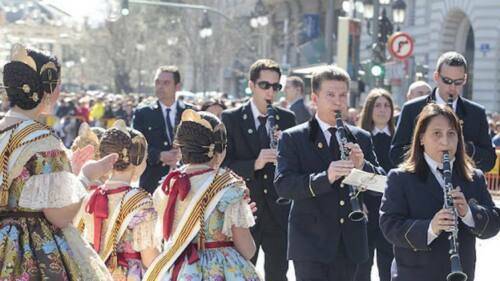 The men of the falla all dressed in black uniforms and the happy-go-lucky pasodoble playing village bands were replaced with “cornetas y tambores” (bugles and drums) bands playing more serious, military style marches . That might have been the end of it and (some feared the end of the festival itself) but in the late seventies, with the return to democracy, people wanted to turn back to the old over-the-top “barroque” traditions of the huerta. The gaudy clothes, the earthy humour and the slightly naff but infectiously popular “pom pom pom” music were all restored. “Paquito el Chocolatero” was back and with a smile on his face. Things almost went too far, as in the eighties there was brief fashion for hiring majorettes to march along with the falla. All eyes were on the twirling batons and mini skirts distracting attention from the overdressed falleras themselves. Anyone who’s had any close contact with a Valencian woman would know that this situation could not last for long and the use of majorettes in parades and the “Ofrenda” was officially banned by the fallas governing body “la Junta Central Fallera” in 1988. Despite their close connection with the festival, these days the bands are a bit the poor relation of Fallas. If money is to be saved, there’ll be no cutbacks on the gunpowder, the beer and spirits or the Fallas monument, the cutbacks will be on the band. In recent years people have said the bands in Fallas are getting younger, less proffessional and lazier, only playing when they have to, at the key moments. If true, that might, of course, be because they are so poorly paid. Even so, the bands are getting more and more adventurous combining the old favourites with modern tunes, South American rythms and jazz to add a bit of much needed variety.